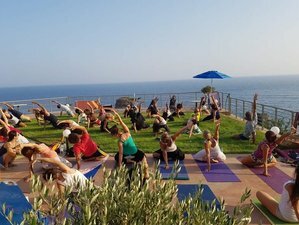 Yogini Wellness Studio organizes an Easter holiday Wellness Retreat that will revitalize your physical body, relax your mind and give you an amazing experience of the Cretan nature, known all over the world. This Easter gives your self the ability to live something different and to combine this holy day with deep Yoga, meditation practices that will change all your self-being in physical, in spiritual and in mental level. This holidays will take place at Lentas is just 75 Km away from Heraklion city in South Crete, a breathtaking place just above the blue sea between the beauty of the Cretan mountains. There will be daily yoga classes working on different traditional systems, such as Ashtanga Vinyasa yoga, Hatha, and Partner yoga. We will discover the benefits of Pilates method in the physical body and we will free our self through mandala drawing. Using the methods Thai yoga massage in groups to feel relaxed. Filoxenia Lentas Apartments are located in a small beautiful bay of the Libyan Sea at the picturesque seaside village of Lentas in the Prefecture of Heraklion. They are built in an isolated and quiet place just 200 meters from the village. Filoxenia Lentas consists of two separate buildings which offer comfortable and well equiped rooms with private balconies. It is encircled by a beautiful garden and offers an impressing view to the sea. Levinthos Retreat Center is located around 40 meter away from Filonexia Apartments. Levinthos retreat center consists of eco-friendly apartments which are carverd into earth, bearing the lowest possible visual and environmental footprint, the cave-houses maximize the authentic relationship between the house-user and the landscape. In addition there are four first floor studios which offer breathtaking view over the Lybean sea. Levinthos offers 8 rooms fully equipped, cozy and comfortable, especially designed to meet the needs of every guest. Their location overlooking the Libyan sea in combination with a small beautiful beach which lies beneath them ensures that guests are immersed in all the peace and calmness that nature generously offers. Yogini wellness Studio states that each participant is fully responsible for herself/himself and her/his actions inside and outside the event. This is especially true for physical exercises which are carried out individually, with partners or in a group. The signee agrees that she/he is in a sufficiently healthy and physically resilient state in order to participate in the event. The course instructor has to be informed about existing injuries before the course starts to make sure special needs can be taken into account. During class, each participant executes the positions/flows as described by the instructor, without overstepping his/her limits. If needed, variations of different positions are shown for various levels. Each participant is responsible for damage caused by herself/himself and exempts the organizer of liability claims. With your registration, you confirm that you agree to our General Terms and Conditions. Course fees and payments vary according to the Workshop module. The registration is binding after receiving the confirmation mail; for more information see section “Withdrawal, cancellation”. Yogini wellness studio reserves the right to cancel, postpone or relocate an announced or current seminar schedule for organizational or commercial reasons. In case of a change/shift, you will be informed immediately and payments will be reimbursed if you do not agree with the alternate date. Private purchased bus, train or airplane tickets for arrival and departure cannot be refunded in such a case. In case of cancellation, you are welcome to provide a substitute participant. If you terminate while the retreat is running the organizers have the right to keep the whole amount of your retreat costs. All information provided on the website is checked carefully. Still, there’s no guarantee that the data is up to date and/or complete at all times. This applies especially to links to other websites. Information can be added, changed or deleted without prior notice. Kind regards, your Yogini wellness studio. The village of Lentas has many traditional taverns and cafes where you can taste the famous Cretan food and enjoy your coffee or drink exactly next to the Libyan Sea.The region is optimal for an undisturbed stay away from the hectic pace of city life and combines relaxation with physical activity such as swimming in the crystal clear waters of the sea or walking along the verdant trekking routes of the area. The place has preserved its natural beauty due to the fact that there are many underground antiquities. The climate of Lentas is mildly hot and dry allowing visitors to have a swim most of the time of the year. The bay is well protected against the wind and the waters are always crystal and clear. There are a lot of beautiful beaches in the area of Lentas, both on the west side like “Ostria” and on the east side like “Diskos”, which extends on the opposite side of the rock of “Lion”. You can also discover the beach of “Trachoulas” which is 10 minutes away by car and after crossing a little gorge about 15 minutes but the sight will be fully compensate you since it is one of the most fantastic beaches in Crete. The deposit is fully refundable if the booking is cancelled up to 90 days before the arrival date.